Her relevant and varied questions warranted careful attention. In this brief window of time, what should I say? How could I answer this Follower of Christ in such a way as to point her to the goodness of God, and simultaneously give her practical steps forward? Her assorted questions ranged From~To. From: What do you do when God doesn't seem to answer? To: How do you believe God when it is hard? Aware that my responses for her needed to be customized, clear and concise—but most of all genuinely helpful—I silently prayed, “God, please help me. I do not want to bruise this true, tender disciple of yours, but, oh how I long for her to know You can be trusted!” I yearned for a connectivity that would bring her back for spiritual conversations again and again and again. Somewhere from within my depth of the reservoir of life’s experiences, God’s Spirit highlighted three principles, and formulated a Tripod of Faith. Be willing to tell God, "At this moment, I stop, and with all my heart, I choose to trust You. I trust You to be in control and to work this out. Here and now, I trust You." Talk to God and say, "More than getting my way (the way I want this to work out), I desire for this to work our Your way. Just like Jesus, I pray, 'Thy will be done.'" She listened, she smiled, and then she moved on...back into life, back into the battles of her world, back into a society that offers zero mercy for a Follower of Christ. Oh God, please protect her, and please use what I said to be remembered and to make a difference. Now here is the surprise. Since that conversation, guess who has benefited the most? Right; yours truly. What I shared with another came forward as God’s message for me. I found this crucial when Larry and I disagreed on an important decision. Tripod of Faith: Thank You, I trust You, Thy will be done. Then, I felt disheartened when a project seemed stalled. Tripod of Faith: Thank You, I trust You, Thy will be done. Later, a phone call heightened my level of concern for the one on the other end of the line. Tripod of Faith: Thank You, I trust You, Thy will be done. Thank You, Sweet Jesus. I dare not trust the sweetest frame but wholly lean on Jesus’ Name, a tried, tested, and true Tripod of Faith. How would you have answered the questions posed by this earnest Christ Follower? 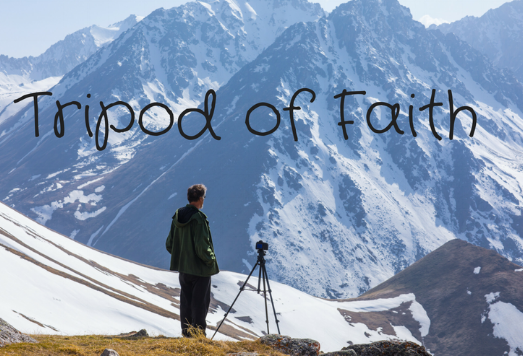 Is there a situation you are facing where the Tripod of Faith can help you move forward?